Mike Kimball is an artist in love with the city. He is best known for his paintings and prints of urban landscapes that seem to inhabit the worlds of both representation and abstraction simultaneously. The subjects of his artwork are found in the urban and industrial environment "Whenever I look at the city, I end up seeing it in terms of patterns and textures and layered geometry. Its all in plain sight if you think to look for it." says Kimball. His artwork focuses on the underlying geometric abstraction of the architecture, typography and design that is found in the urban landscape, as well as the curious effect that time and chaos has on that geometric order as it moves towards disorder and entropy. Kimball has exhibited his work both nationally and and internationally. He is a member of the California Society of Printmakers, and has printed at many professional printmaking studios including the KALA institute in Berkeley, CA and the Centrum Franz Masereel studios in Kasterlee, Belgium. 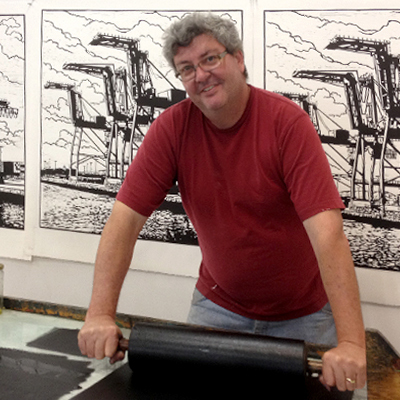 Recently he has been a guest artist at the San Francisco Center for the Book's annual "Roadworks" show, where his oversize linoleum block prints were printed with a steamroller. Kimball maintains an art studio in the South of Market area (SOMA) of San Francisco, where he also teaches screen printing methods with artist Hilary Williams.